Debbie and I acquired a horsebox about eight years ago. It opened up many new opportunities to explore the Surrey countryside on horseback, riding our two horses. One of the hacks which quickly became a favourite circuit is based on the rough parking area at Albury green (actually part of Albury Heath). Most riders who come here, whether from local stables or, like us, in a horsebox, then head west down Sandy Lane and up to the many sandy paths on Blackheath, which is indeed rewarding. But we soon 'discovered' a more diverse ride to the east. It takes us over Shere Heath, down the deeply incised Dark Lane, over two fords on Chantry Lane and the delightfully narrow Rectory Lane, through the heart of Shere village (teeming with visitors on bright weekends), east towards Gomshall, then up Tower Hill Lane — another sunken lane doubtless of great vintage — and down Jesses Lane before heading west again along cross-field bridleways, descending down an enclosed path to Hound House Road, up to Parklands, across the bridle crossing over the railway at Shere Heath, and back to Albury Heath. We come this way perhaps once every month or two: the land is well drained, and the paths a pleasure in every season. Dark Lane Copyright Stefan Czapski and licensed for reuse under this Creative Commons Licence. low branches or projecting brambles are hazardous: the horse has little sense of any obstruction above its own height, and the rider must watch out for him or herself — else the rider may be injured or knocked off. Over the last ten or fifteen years, the bridleways, lanes and indeed many roads we have been riding have been getting narrower and more hemmed in. This is because the use of contractors on diminishing budgets has established a cycle of decline. Each contractual period, firms bid for the cutting contract on price. Once the contract is awarded, they have no incentive to perform on specification, and will do the minimum that is necessary to permit passage (at least, on foot). The contract will provide for a minimum width, but will not take account of the character of the path, so each year, the vegetation on the outer edges of the path becomes better established and closes in. After a few years, saplings growing in the margins become trees, and can only be removed with a saw, which would add time and cost to the performance of the contract, so they are left. Those trees project branches over the path, or lean into the path to draw light, which narrows what is left for the user (and creates more work for contractors in future years: but that will be some other contractor's job). The council has no wish to demand compliance with even the limited contract specification, because to do so would push up bid prices in future — and the council cannot afford to pay more. So each party turns a blind eye to the specification. Ways which were once broad lanes become narrow paths, and even if cut to specification, allow for little more than the profile of a horse rider in the days immediately after the work has been done. Three months later, however, or after heavy rain weighs down all the branches, it is very different. And so it was yesterday. We are familiar with Tower Hill Lane, an old sunken bridleway heading south out of Gomshall, as a steady uphill trot for the horses, but no more. Nettles infest the first thirty metres, while endless low branches on the lower section make it unwise to pick up any speed. The top part has always been a bit narrow, but now, the combination of brambles, bracken and holly made it all but impassable: had it been physically possible to turn round, we would have done. I had brought a pair of secateurs with me, but it is hard to do more than remove the most threatening strands which are suspended provocatively across the path when you're mounted. The outcome was a left arm covered in scratches, horses' flanks covered in nettle stings, and an £80 new pair of breeches looking like they're fit only for mucking out. We can, and will, report the overgrowth to the council. The rights of way team has recently lost three officers and has a huge backlog of unfulfilled reports. Even if there is someone to act on the report, there probably won't be any budget to deal with spot problems, and these paths will have to await their annual cut. We don't know when the cut will take place: it could be this week, or it might not be until the end of the summer — or it might have already taken place, and that's it for this year. I'm not sure even the council officers know, individually, which path is cut when: that may be a matter of considerable discretion for the contractors (which will also save money). So we have no idea when it might be sensible to return, although a visit during the winter might be more realistic. Instead, perhaps we will head west in the future, along with all the other riders, and ride over the unenclosed tracks on Blackheath instead. Some will say that a few overgrown paths impassable to horse riders is no big deal at a time of searing cuts to public services. Yet these are paths in one of the most popular areas for rural recreation in England: about 40km from central London, easily accessible to millions, hugely popular for walking, cycling and horse riding. 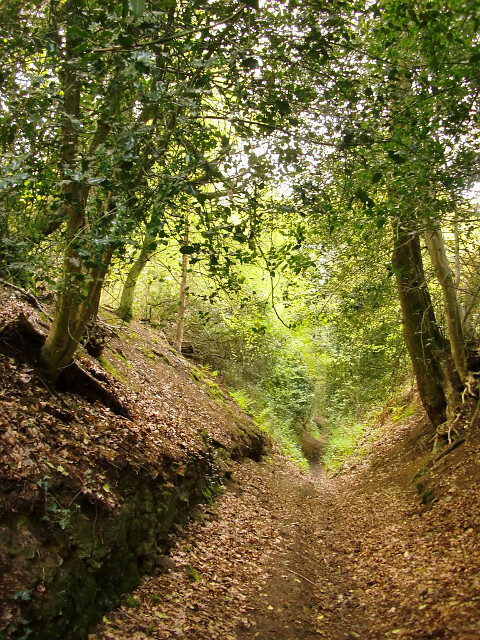 If paths in the Surrey Hills are becoming difficult to use, what can we expect in the more remote parts of England (to find out, try reading Catriona Cook's day 8 blog of the Journey for Access from Dartmoor to the New Forest)? And if motorists think that they're immune from such trials, don't be so sure. Just the same cuts are being made to road maintenance budgets, and in the same way, many roads have their vegetation cut just once a year. Trees have become well established in the verges and hedges, many roads have become enveloped in walls (and often ceilings — try a double deck bus route in the countryside) of greenery, and we have greatly increased the costs of future maintenance by reducing expenditure in the short term. Try taking a delivery van down some of those minor roads which we road last weekend, such as Chantry Lane, and you'll find it's not just horses and riders that end up with scratches. On some roads, even motorists struggle to avoid the overhanging brambles and branches, and this will continue to deteriorate. A concluding thought: last year, Chantry Lane, which apart from being a useful road for walkers, riders and cyclists, also serves two cottages, was resurfaced. There was nothing particularly bad about the state of the road before, but the highways authority, like many others, receives additional, ring-fenced funding (Surrey receives nearly £1m in 2016–17, now virtually the only grant paid for specific purposes) for resurfacing roads. So it is that the council can afford to resurface a truly minor road to some cottages — but it cannot find the funds to keep the high, roadside banks from closing in over the smart new blacktop.